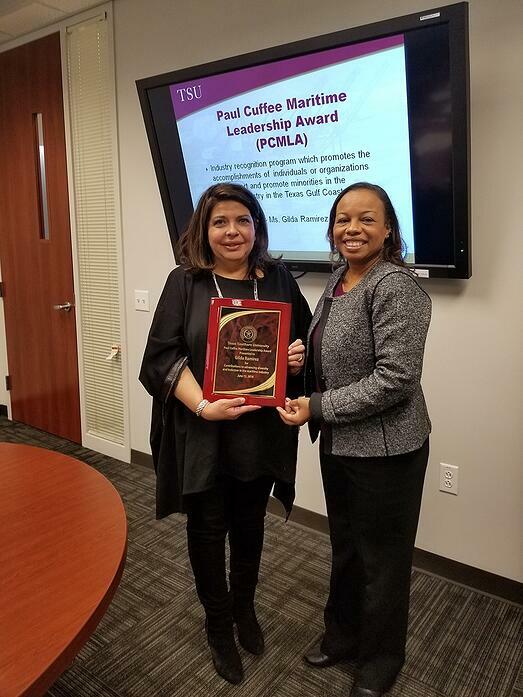 Port Houston Senior Director of Small Business and Education Outreach, Gilda Ramirez, received the Texas Southern University 2018 Paul Cuffee Maritime Leadership Award at the college’s advisory board meeting Nov. 15. The award is given to an individual or organization that supports minorities in the maritime industry along the Texas Gulf Coast. “I am honored to have received this award given to professionals that have made a difference in the maritime industry,” said Ramirez. Ramirez has led the port’s small business development efforts since the program’s inception in 2002 and has been a driver of the Port of Houston Partners in Maritime Education program, a nonprofit that offers education opportunities and scholarships to students in the Houston region. She is native Houstonian from the East End region and joined Port Houston in 2002 as manager of Small Business Development. Under Ramirez’ leadership, the port has received numerous awards by organizations. She has served on various boards, is an active member of several chambers of commerce and continues to work as a small business advocate.